“What follows is my 100-day action plan to Make America Great Again,” he declared, enumerating legislative and executive actions that were punctuated by applause from the crowd. The following week, two of Trump’s campaign advisers published a white paper providing additional details on the trillion dollar plan. The paper largely focused on tax-breaks for private investors who put their money toward infrastructure projects. The term “public-private partnerships,” however, appeared only twice. Broadly speaking, public-private partnerships (P3s) are agreements in which a private sector party provides a service that is traditionally delivered by a public agency. In terms of infrastructure, a private partner typically assumes significant responsibility and risk over a project’s design, construction or operation. As the Trump administration hammers out the fine print of its proposal, it may find willing partners at the state level, as legislatures across the country show increased interest in P3s. Private investors and infrastructure associations also appear excited about the prospect. Public-private partnerships, however, have been responsible for only a small number of infrastructure projects in the last three decades. Less than 1 percent of spending on highways nationwide, for example, came from P3s in the last 25 years, and a number of these highway projects hit stumbling blocks. As Trump pushes for private funding to support his $1 trillion infrastructure plan, the exact role — and effectiveness — of P3s in a large-scale, nationwide infrastructure plan remains unclear. 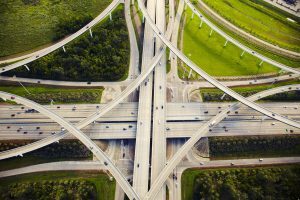 States increasingly are turning to P3s to finance transportation projects that traditionally have been underwritten by federal, state and local governments. In March, Kentucky became the 34th state to authorize the use of P3s. In June, New Hampshire became the 35th. Governments also are turning to P3s for infrastructure projects that have nothing to do with roads and bridges. In November, Democratic Mayor Muriel Bowser of Washington, D.C., announced the creation of the Office of Public-Private Partnerships to promote private investment in infrastructure projects across the District. The office plans to lead the construction of a new jail, a renovation of police headquarters, and a modernization of the city’s streetlight system. A key benefit of P3s comes from “leveraging the private sector’s expertise and resources,” a January report by the National Conference of State Legislatures said. Proponents of P3s argue that competition within the private sector promotes innovative and cost-effective solutions, which often evade public agencies. Private sector partners also assume a portion of the risk, which means taxpayers do not solely bear the burden if a project is delayed or derailed. Both prospects appeal to governors and mayors grappling with tight budgets and shrinking tax revenue to finance big public works projects. And the laws, which hold out the expectation that roads and bridges will be repaired and jobs will be created to do the work, can spark enthusiasm from the private sector. Turning to private investors to finance public works isn’t free money. Investors expect to be paid back and earn a profit on their investment. Tolls often enable investors to generate revenue and keep projects as close to revenue-neutral as possible. But critics point out the perils of P3s relying too heavily on tolls and other user fees to generate revenue. Many private investors, for example, push for noncompete clauses that limit or ban the development and maintenance of surrounding projects. The noncompete clauses are designed to assuage investors who fear the construction of similar public projects might cut into their revenue. But Kevin DeGood, director of infrastructure policy at the left-leaning Center for American Progress think tank, said they can tie the hands of public officials who may want to construct something for the common good. Some states have considered legislation that would prohibit noncompete clauses in public-private partnerships. A bill before the Michigan Legislature, for example, would ban such clauses in P3 agreements. And P3s may not work everywhere. For example, investors may ignore projects planned for less-populated areas if traffic on their roadways would not generate enough toll revenue. Thirty-six highway projects in the last 25 years have relied on P3s, and many of them were funded at least in part through tolls, according to a Congressional Budget Office report last year. Although many of the projects were completed successfully, the report identified risks associated with those that depended too heavily on tolls. The Capital Beltway HOT (high-occupancy toll) Lane project in Virginia is an example of a promising P3 that relied heavily on tolls whose revenue ultimately could not cover the project’s debt obligations. In 2007, a private consortium reached a deal with the state of Virginia to construct HOT lanes on a 14-mile stretch of the Capital Beltway, long considered one of the most congested highways in the nation. The project increased the number of lanes on the highway and charged tolls in HOV lanes based on the level of traffic congestion. In exchange for financing more than two-thirds of the $1.4 billion project, the private partners would collect toll revenue for the next 80 years. Construction was completed in late 2012, slightly ahead of schedule, but traffic in the HOT lanes was initially lower than projected. As a result, Transurban, the company responsible for processing tolls and violations, faced a deficit totaling hundreds of millions of dollars. Following the lower-than-expected revenue, Transurban began charging excessive penalties for motorists who failed to pay toll fees, which resulted in a class-action lawsuit against the company. According to court documents, Transurban allegedly pursued one plaintiff for $9,440.90 for 10 purported toll violations totaling approximately $20. Another plaintiff, despite having a positive balance on his EZ Pass account, received summonses for $15,000 for toll violations totaling $30.65. The case was settled in March and guaranteed greater protection for motorists against harsh penalties and predatory collection practices by third-party toll processors. According to Transurban, traffic and toll revenue has increased since the lanes on the Capital Beltway first opened. Virginia has since proposed expanding HOT lanes to I-95 and adding HOT lanes along I-395 and I-66 in the crowded Washington, D.C., area around the Beltway. User fees are not the only way to support public-private partnerships for infrastructure projects. Another model is called “availability payment” agreements, in which a private investor takes on most of the debt for a project up front and the public partner provides payments to the private partner during and after construction of the project. In Florida, for example, the Port of Miami Tunnel was constructed through such a partnership. The private partner assumed most of the financial burden up front and the state agreed to pay off the debt in milestone payments over the next several decades. The tunnel opened in 2014 and was ahead of schedule. But Randal O’Toole, senior fellow at the libertarian Cato Institute, said availability payment P3s can exacerbate a state’s debt problems while simultaneously hiding them. In its 2015 report, the Congressional Budget Office admonished such practices and advocated for government agencies to strive to be as transparent as possible about all of its debt. Transportation analysts remain split over which P3 model Trump’s ambitious infrastructure plan will favor — partnerships with revenue generated from user fees such as tolls, or partnerships that rely on availability payments. Cato’s O’Toole, to his displeasure, said he thinks Trump will favor availability payment partnerships. Robert Poole, director of transportation policy at the libertarian Reason Foundation, said he thinks Trump will favor partnerships that rely on user fees. Public-private partnerships under Trump’s plan may combine both models, but that still may not cover the costs of some major infrastructure projects. Loans under the federal Transportation Infrastructure Finance and Innovation Act, or “TIFIA” loans, are commonly used to help finance P3 transportation projects. TIFIA loans, Jones said, are often used to “fill in the gap” and help partnerships reach their funding needs — though it’s possible the loans could finance up to 80 percent of a project. Trump also hasn’t ruled out creating a national infrastructure bank, which would provide seed money for infrastructure projects and partnerships around the country. One of Trump’s biggest hurdles, though, may be convincing members of Congress to support his plan. Infrastructure has long been considered an issue with bipartisan support, but some lawmakers, including Republicans, are skeptical. At the Washington Ideas Forum in September, House Speaker Paul Ryan, a Wisconsin Republican, laughed at the suggestion that he would help Trump pass an infrastructure proposal totaling $550 billion or more.